On a visit to a Disney theme park, a little girl and her mother came to a fenced-off construction site. To her mother’s dismay, the little girl threw her favorite Disney doll, Belle, over the fence. When park staff retrieved the doll, it was in a sorry state, spattered with mud, dress torn, hair bedraggled. Attempts to find a replacement in the shop proved futile: Belle had been replaced by a newer model. So the doll was taken first to a makeup artist, who washed her and styled her hair, then to the wardrobe department, which made her a new dress, and finally to a ‘party’ with other Disney princesses, with a photographer in attendance. Good as new, Belle was returned to her owner that evening, along with a photo album that showed what a great time she’d had during her ‘makeover’. Later, in a thank you letter, the girl’s mother described the moment of Belle’s return as ‘pure magic’. While such an experience is magic for customers, for organizations like Disney it is method. The theme park team didn’t consult a script or take instructions from their manager. They did what they did because Disney has created a corporate culture where going the extra mile for customers come naturally. Corporate Culture is one of those terms that are difficult to express distinctly, but everyone knows it when they sense it. Members of an organization soon come to sense the particular culture of an organization. A clear understanding of the meaning and importance of corporate culture remains elusive for many managers. Some managers choose to deny the existence of a culture in their organizations; others are intimidated by the thought of trying anything so fuzzy, let alone of finding ways to manage it. Although the concept of corporate culture is abstract and may seem somewhat elusive, it is nonetheless real and can have a decisive impact on corporate success and profitability. Every organization, from a small entrepreneurship to a multibillion-dollar organization, has a corporate culture whether it knows or not. The corporate culture is much like a personality, in that it changes over time as a result of a firm’s own development or changes in the environment. Corporate culture consists of values, beliefs, and norms. • Values are what an organization considers most important with respect to its operations, its employees, and its customers – the things an organization holds most dear, strives for, and wants to protect at all costs. • Beliefs are assumptions individuals hold about themselves, their customers, and their organization. • Norms are unwritten rules of behavior that address such issues as how employees dress and interact. Although values, beliefs and norms are constructed around a range of organizational variables, authors of the book Growing Pains state that how the corporate culture is defined with respect to the following four areas has the most impact on an organization’s success. Jack Welch puts corporate culture ahead of results. Welch understood the fundamental power of strong corporate culture to drive business results, an insight that was also the core tenet of his book ‘Winning with a Culture of Recognition’. Welch in an article in Fortune said “Culture matters as much as hard numbers. If your company’s culture is to mean anything, you have to hang – publicly – those in your midst who would destroy it. Creating a healthy, high-integrity organizational culture is not puppies and rainbows. And yet, for some reason, too many leaders think a company’s values can be relegated to a five-minute conversation between HR and a new employee. Or they think culture is about picking which words to engrave on a plaque in the lobby. • Clear rewards and consequences for how employees reflect the values in their work. In her interview at The Senate Talk Show in Pune, Meher Pudumjee shared that when she talks to any new joinee in Thermax, whether an engineer trainee or a lateral recruit, she tells them about their history, culture, values & vision. Pudumjee then puts up Thermax’s values before them and asks them if they have heard of Enron?! She avers that if they compare Thermax and Enron’s values, they will look similar! As a matter of fact, all organizations have similar values ‘on paper’. It is how each and every person in the organization follows these values that make all the difference. Values and culture of the organization is this ‘feel’ that one gets while dealing with the organization or while working within it. Pudumjee asserts that the best way to understand an organization’s culture is to talk to its people and even more important ‘observe’. One can say anything one wants, but what is important is ‘walking the talk’. What one says doesn’t matter; people in the organization have to feel it. That’s the whole idea of DNA or culture of an organization. Have you ever wondered why despite umpteen number of coffee and tea cafe chains, Starbucks continues to be unique? Or despite hundreds of world class amusement and theme parks across the world, Disney continues to be unique? 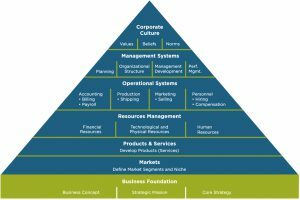 This is because to build a successful and sustainable organization, competitors fail to understand that they are NOT ONLY competing on their products/services but on each of the six levels of the Pyramid of Organizational Development (given below). An organization must do well on each of these six processes individually and in a consolidated manner. Corporate culture is the apex tier of this pyramid and can become the most important differentiator. Culture has a critical impact on overall organizational success. Culture influences every aspect of the Pyramid of Organizational Development and every level of the pyramid has an impact of the culture. Corporate culture has a direct impact on financial performance of an organization. The fabulously written book called ‘Growing Pains’ is a bible on a very important but as much ignored subject of ‘Organization Development’. The book provides a description on how culture changes and how this change process can be managed to maintain an organization’s effectiveness while it grows.